Cut zucchini in half lengthwise then crosswise into ½-inch slices. Place on a foil-lined baking sheet. Toss with sun-dried tomatoes and their oil. Season with salt & pepper. Once oven has heated, roast for 5 minutes, then toss, and roast another 5 minutes. After you toss the zucchini, season both sides of fish with salt & pepper. Heat a small amount of oil in a nonstick skillet over medium heat. When oil is hot, add fish and cook 3-5 minutes or until golden brown. Gently turn fish with a spatula, place lid on the skillet, and cook another 3-5 minutes depending on thickness. Test fish for doneness, then squeeze lemon over fish and into the skillet. Remove from heat. Pour vinaigrette base into the bottom of your salad bowl and add an equal amount of olive oil. Whisk or mix with a fork to combine. If this looks like too much dressing, remove some before adding the greens. Toss gently and season with salt & pepper to taste. 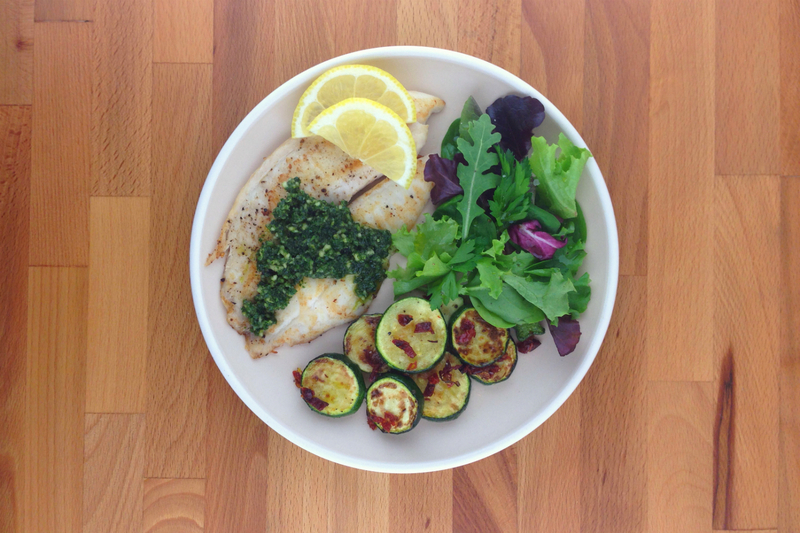 Divide tilapia between plates, drizzle with any lemon juice that remains in the pan and finish with a small dollop of the parsley pesto. Serve roasted zucchini and the herb salad on the side. This entry was posted in Meal-Kit Recipes, Seafood, Seasonal, Winter on January 23, 2016 by Megan Rappe.